Given the wind and swell forecast we decided to take Shearwater out of the water early for her seasonal break. If we hadn’t taken her out when we did we wouldn’t have been able to for some time. We don’t like to have to cancel trips but the forecast was pretty clear and it wasn’t good news. 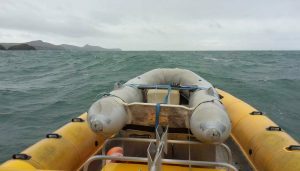 We certainly wouldn’t have been doing our offshore charter today in a stiff north westerly 🙂 . We’ve had a long run of good weather lately so we can’t complain but it was time for Shearwater to come home. 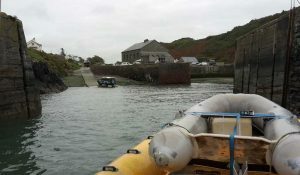 Tim and Charlie had a wettish trip round to Porthgain from St Justinian (with Shearwater’s Mini Me dinghy lashed to the locker 🙂 ) but the tide wasn’t high enough to tie up at Porthgain so I got to run away out to sea for a while. I got soaked inside two layers of waterproofs – just what the doctor ordered! Weather permitting we relaunch around 9th / 10th October but right now Shearwater is resting on her trailer and we’ll sleep well when the wind howls.